Today we are looking at a slightly older piece. 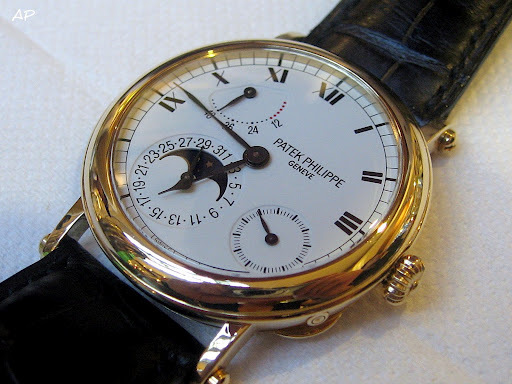 First Introduced to Patek’s range in 1999, and now discontinued, this classic Ref. 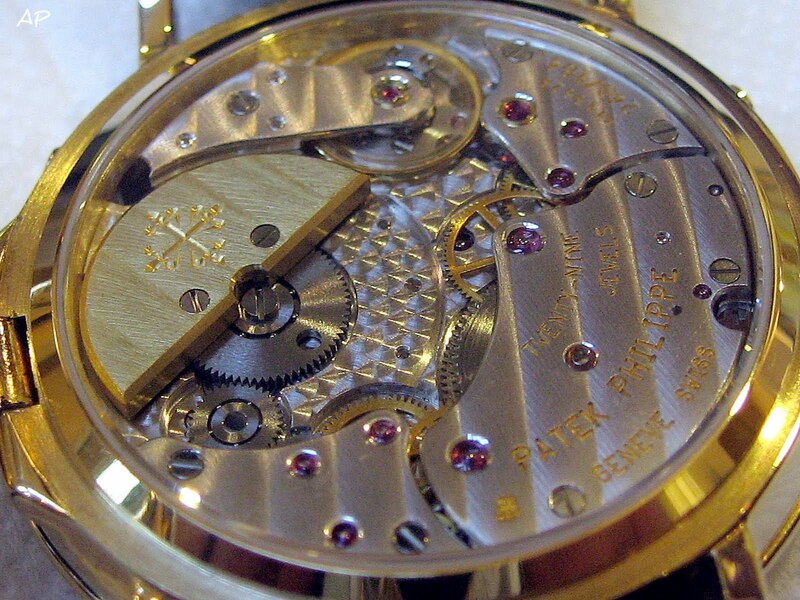 5054 is the rose gold model. It was also available in white gold and Platinum. Interestingly, the case is only 31mm, but it seems to sit much larger than this on the wrist. 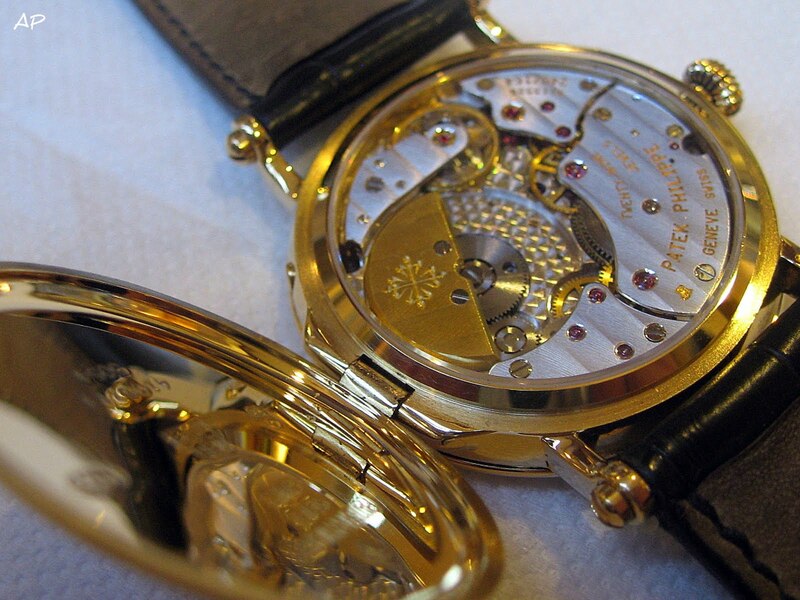 The case is 3.98mm thick, and has a dual position winding crown – pushed in for manual winding, and pulled out for setting the time. Both the date and moon are set by push pieces, and if you try to make changes whilst the automatic date change is engaged, an automatic safety device prevents internal damage. The milled, turban crown is a noticeable departure from the more usual crown decorated with the Calatrava cross. The dial is porcelain, featuring a railway track. As you can see, the 48 hour power reserve is at 10 to 11 o’clock, the date and moonphase at 7 o’clock, and the small seconds at 4 to 5 o’clock. 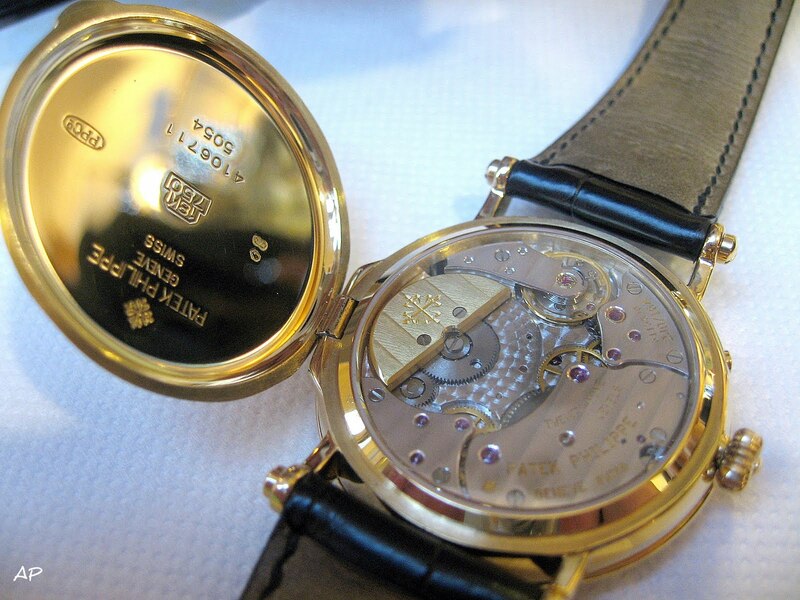 A beautiful polished Officer’s style case (which Patek call the ‘Directoire’ case) with a hinged cover over a sapphire crystal back opens up to show 265 parts, a 22k gold off-centre mini rotor, and the Patek Calibre 240 movement. The only thing that beats an open case back, to me, anyway, is an Officer’s case, both for the anticipation of the ‘reveal’, and the nod to pocket watches. First released by Patek Philippe in 1977, the Cal.240 was created as a thin base movement for Patek’s perpetual calendars. At only 2.4mm thick, with a Gyromax balance, the movement allows for a perpetual automatic caliber with a total thickness of only 3.7mm. As is evidenced by the Ref.5054, Cal.240 ended up being used for a variety of watches from the brand, not just perpetual calendars. The watch is water-resistant to 25m. Naturally, its owner makes sure it doesn’t go anywhere near water.